Findlay-Evans use liquid applied waterproofing systems to solve the many challenges that occur with waterproofing repairs & refurbishment to rectify leaking roofs. Concrete, Metal or Timber Roof. Flat & Low Slope Roof. ​Our experienced team of tradesmen have developed a robust & long-life waterproofing system that is ideal for roof repairs - using solvent-free Liquid Rubber. Spray applied Liquid Rubber can bring a roof back to life with a single over coat of a liquid membrane. Being liquid, our membranes will provide a watertight barrier no matter the roof shape, surface condition, amount of upturns, penetrations or rooftop services located. Seamless - no joins or overlaps which are areas of weakness. Durable & Versatile - no "down time" is experienced during roof refurbishment. Extreme Flexibility - membrane will move with roof surface. Quick Application - can adhere to strict timelines & operational restrictions on-site. Heat & Flame Free - environmentally friendly, odour free & suitable for sensitive roof air-handling outlets, HVAC etc. Paul Evans, Manager/Director of Findlay-Evans, discusses Liquid Rubber products. Leaking roofs in the commercial sector may involve damaging water ingress into plant rooms, sensitive business areas, infrastructure and amenities. Roof waterproofing repairs are time critical to prevent further structural issues. Liquid Applied Waterproofing Products provide a seamless, UV stable and permanent waterproof membrane for roof refurbishment - no matter the age, condition or structure of the existing surface. Chosen for its odourless, and versatile qualities, Liquid Waterproofing Systems are an ideal product to use with difficult roof access, quick application means projects can adhere to strict time lines and operational restrictions on-site. Findlay-Evans are Registered Building Contractors & Certified Waterproofers. This means, our Team is experienced in construction methods, building design, OH&S, SWIMS and industrial & infrastructure facilities. These skills are vital for complex & challenging roof projects that often require case-by-case solutions to permanently fix water leaks & roof repairs. Challenging roof refurbishment demands the highest of QHSE (Quality, Health, Safety & Environment) standards within tight timescales. Complex roof areas involving high level of detailing & with numerous HVAC units, cabling, steel works, pipe & infrastructure supports. Removal of existing roof ballast. 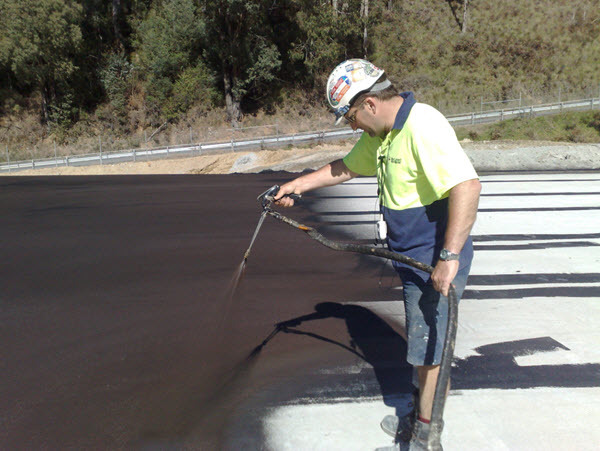 Liquid membranes can be sprayed under, around & over roof infrastructures to make water tight. May require total removal of existing deteriorated membrane or ballast to return to base roof surface. Liquid Membranes can very often overcoat the existing surface WITHOUT removal -saving time & money. Mobile roof waterproofing equipment ideal for difficult roof access. Provide safe work environment & adhere to SWIMS & compliance. Project restricted by time constraints, heights, working with facilities & maintenance managers . 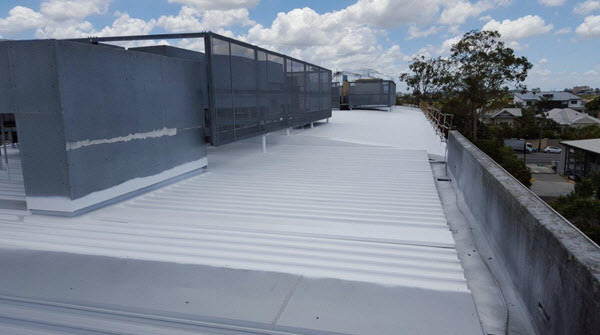 The versatility of the Liquid Rubber System & ease of application mean our Team can provide a watertight, seamless membrane that fully covers all roof areas, complex details, penetrations, pipes & outlets on the roof structure. Liquid Rubber is quick and easy to apply as well as versatile and durable. Liquid Applied Membranes are flexible and so will move with the roof structure & building envelope. Just about ALL of our projects are delivered on time and on budget. 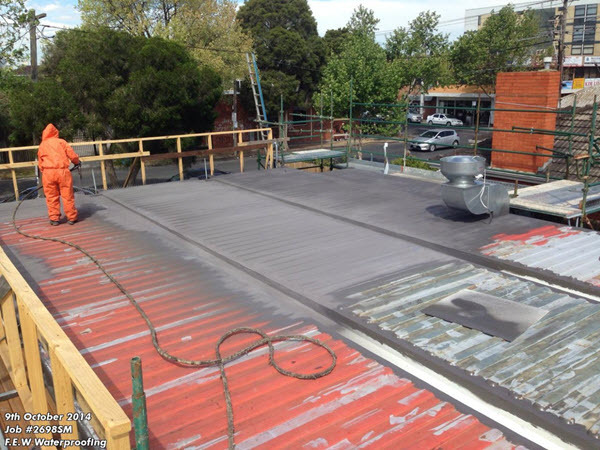 Liquid Applied Membranes do not use heat, flames or VOC s.
Findlay-Evans are proud to be recognised as leaders in Melbourne roof waterproofing contractors. Using reliable waterproofing systems combined with our skilled Team - NO SUBCONTRACTORS - we deliver projects successfully, on budget & on-time.